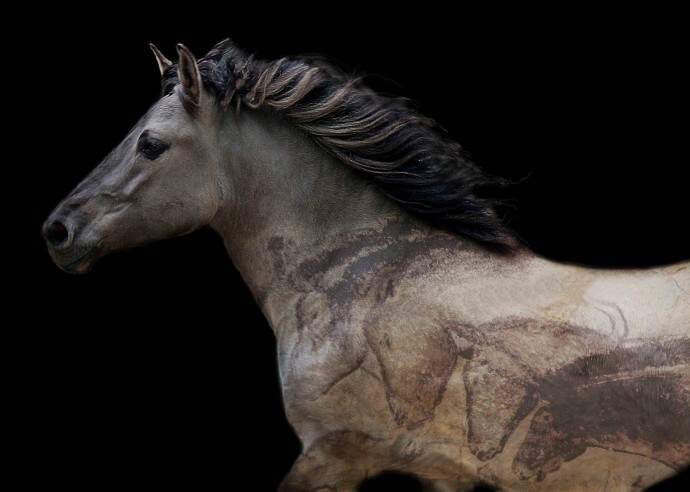 The Tarpan, an extinct type of the Eurasian wild horse, features in the unique recently released half-hour documentary film called “TARPAN: Repainting An Ancient Picture” which will soon be screened in New York. The poster for “TARPAN: Repainting An Ancient Picture” . It is the worthy result of over a year of work by Jen Miller and Sophie Dia Pegrum, two American filmmakers at Horsefly Films. It is also the second in their ongoing series of informative and beautiful films documenting and celebrating rare horse breeds and the unique, and often vanishing, cultures that surround them. The Tarpan (Equus ferus ferus) is also known as the Eurasian wild horse. The Tarpan was a prehistoric wild horse type that ranged from Southern France and Northern Spain east to central Russia. Tarpans went extinct in wild nature between 1875 and 1890, and the last known wild mare was accidentally killed in Russia during an attempt to capture it. The last captive Tarpan died in 1909 in a Ukrainian zoo. Beginning in the 1930s, several attempts have since been initiated to re-create or bring back a look-a-like Tarpan through selective breeding with domestic races which allegedly retained much Tarpan DNA in their genome. 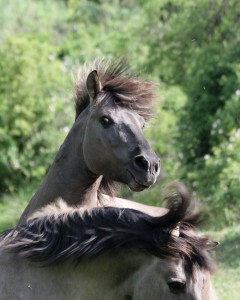 This look-a-like Tarpan is also known as the Konik (Polish for ‘little horse’) Polski. This breed has originated from Polish tarpan re-creation projects. Konik Polski is mentioned in the study “Rewilding horses in Europe”, that was recently released by Rewilding Europe, as one the horse types which are most suitable for rewilding. In some countries – like the Netherlands – this Polish Konik has been released to nature reserves very successfully, with the beginning some thirty years ago. From there these horses have then been brought to Latvia, Bulgaria and other European countries. The film “TARPAN: Repainting An Ancient Picture” is shot on location in Poland and Bulgaria. In September 2011, the first 12 Tarpans were brought from the Netherlands to Bulgaria by the ARK Foundation and these settled successfully in the Rhodope Mountains. Three years later, a second herd of 35 Tarpans was released in the same area, which has since been nominated as a possible new rewilding area for Rewilding Europe. This release into the wild is now followed by the release of the movie about the Tarpans. Tarpans in the Eastern Rhodopes, Bulgaria. – “Through our work filming horses, we learned there are over 600 breeds of horses around the world that are endangered and in danger of going extinct,”explain Jen and Sophie. “Most people have never heard of any of them and our vision is to create a cinematic library to educate the public and shine a light on these breeds and vanishing horse cultures in an effort to conserve and preserve them for future generations. Our motto is “The History of Man is the History of the Horse”. After beginning the series with the critically-endangered Skyrian Horse of Greece, the unsung equine partner of Olympic Gods and Alexander the Great, it brought the spectre of extinction front and center for Jen and Sophie. They happened to read a post online about the rewilding of the Tarpan into the Rhodope as part of the New Thracian Gold project. That immediately sparked their interest and they were off and running. The result is “TARPAN: Repainting An Ancient Picture”. The film will be shown as part of the Equus Film Festival in New York in mid-November. In addition, Jen and Sophie plan to create another premiere screening event in New York and Chicago for the Bulgarian Consulates, and a Bulgarian premiere in Sofia and local screenings throughout the Rhodope region. “It is their story and we feel very strongly they should see it! “, Jen and Sophie say. The film will be available for purchase on DVD from their website.